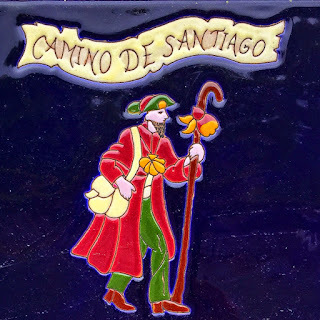 A short journal about walking the Portuguese Way of Saint James - Route of San Miguel from Valença, Portugal to Santiago de Compostela, Spain - April 2015. Synchronicity? After booking my trip to Lisbon, I started researching the Camino online. That's when I found out about this new documentary on the Camino. The documentary follows six pilgrims on the French Camino and documents their stories on the way to Santiago de Compostela. It's not on mainstream but it's had screenings in different cities around the world. But as a sign (I took it as one anyways) just about a week before my departure, there was a screening at the Santa Clara University Jesuit School in Berkeley, just a few miles from our house. I took John to the screening with me. As we walked into the room, the first face we saw was Viven's - the nice lady that had helped me purchased my backpack at REI. She was there with her husband Phil! At the end of the screening we met Annie, one of the pilgrims in the movie, and also one of the producers. She talked about her transformative experience walking the Camino Frances and asked the room who had plans to walk to Santiago. I told her of my departure on the 5th. She had me stand, asked the entire room to join her and offered me a blessing. It was a little awkward to be put on the spot but mighty nice of her and the whole room to pray for my Camino. Well, the answer is simple. I grew up listening to my dad telling me about having the best time in Portugal and Spain. He loved it. He wanted to go back and walk the Camino de Santiago. He wanted to do this with his good friend, and my godfather, Moreira. My father passed in 2012, the day after he turned 75. He never walked to Santiago. I am walking in his honor. I am walking for my dad. It's not repentance; it's not a religious quest. It just something that reminds me of my father and his stories. He liked to talk, flourishing his speech is ways I am not capable of doing. When he talked he made Portugal and Spain sound magical. He was keen on speaking in family gatherings because he always had something to say. Since he was the elder of the family, everyone stopped and listened. I stopped and listened. I miss listing to his voice. I miss having a conversation with him. So I am going to walk his walk. It was his walk. It is now my walk.